Acupuncture is a safe and very effective natural, alternative therapy that is used to heal illnesses, prevent disease and improve well being. 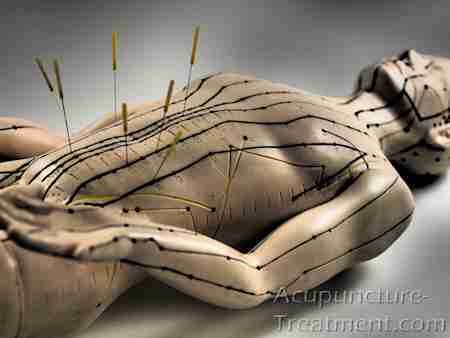 Acupuncture is a method consists of inserting tiny, hair-thin needles into specific points in the body. The needles are then gently stimulated to trigger the body’s natural healing response. Best known as a common method to relieve painful conditions such as neck pain, Low back pain, hip pain, migraines, TMJ pain and management of sports injuries. Acupuncture can also be an effective alternative solution for conditions such as smoking addiction, over weight, anxiety, IBS, skin problems, pregnancy and gynecological issues, and infertility (read the infertility frequently asked questions and infertility research sections for more). To learn more about acupuncture treatment, click the links in the left navigation panel or contact us anytime with your questions. Certain back injuries can be effectively treated with chiropractic spinal manipulations, in conjunction with acupuncture treatment. Our muscle mass and strength declines as we age. True or False? Low back pain is very common among the elderly and less common among young and athletic individuals. True or False? Although moxibustion has been an integral part of the original concepts of acupuncture, I was surprised to learn that it is somewhat ignored by many acupuncturists in Western countries. A growing number of Canadians have experienced acupuncture, yet only a few have ever tried moxibustion treatment. In the Orient, acupuncture has long been utilized to promote fertility and treat a variety of gynecological conditions. In recent years, there has been a growing interest in acupuncture among reproductive specialists in the West. The attention has especially intensified since 2002 when German researchers announced significantly higher pregnancy rates among women undergoing In Vitro Fertilization (IVF) in conjunction with acupuncture. The May 2006 issue of the journal, Fertility and Sterility, featured eight acupuncture related articles. Read more? Breathing is a basic living activity that everyone performs every single moment without paying any attention to the act. Besides the simple exchange of air, breathing plays another critical role. Breathing can become a powerful tool to balance and optimize our nervous system and hormonal activity, thus creating a positive impact on our entire physiological system. Read more? Every winter as the temperature cools down, we see more patients with acute low back injuries. It is common knowledge that you should bend your knees when lifting heavy objects. The reason behind this recommendation offered by health care professionals, is that by bending your knees, most of the heavy load is shifted to the hips and thighs, instead of directly to the low back. While this biomechanical explanation is valid, it does not fully explain the following facts commonly observed in everyday clinical practice: Read more?